Ever since its debut Angry Birds has remained at the top of charts in every App Store. But the game is now losing its charm. 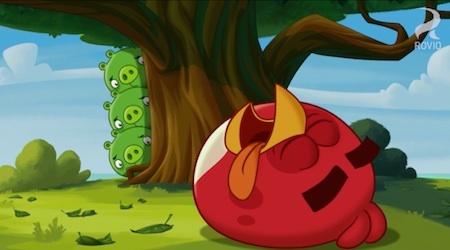 Rovio, owner of Angry Birds has stated that its gaming sales were not as strong as they were last year. This is not the worse news for the company yet. As of last year Rovio now has 300 more employees. Which means it made less than half the money it did in 2012. In a talk with Rovio, the company said that they are not giving much thought to the falling profits as they bought a new animation studio, made theme park deals and opened a merchandising division. All these expenditures cut into the profits the company made last year. The company’s merchandising division is a huge success. It offers toys and other consumer products based on the angry birds theme. It now accounts for almost half the company’s sales. But the other new projects did not prove much successful in making profits, like the Angry Birds movie, which is set to arrive in late 2016. In its gaming division the profits are already starting to look bleak. Despite having launched Angry Birds Star Wars II and other properties in 2013, the company actually made less on games than the year before. To increase sales, Rovio recently launched freemium features in all its games like in-game purchases etc. These new feature are bringing more cash but they are also alienating gamers who don’t like such features. But we are still waiting to see if the extra cash and reduced players work on the positive side for Rovio or not. Like the animation studio and other recent decisions, we’ll likely have to wait until next year to find out. Compared to the recent gaming companies like King (Candy Crush Saga) and Supercell (Clash of Clans), the growth rate of Angry Birds is lagging far behind. We have to wait and see how Rovio plays it out. However, there is a lesson for new gaming companies in here as well. They should not rely on a single gaming franchise and try to make more diverse gaming franchises to cater to shifting consumer interest. Since lot of new games has been launched I guess angry bird has got this reduced profits.